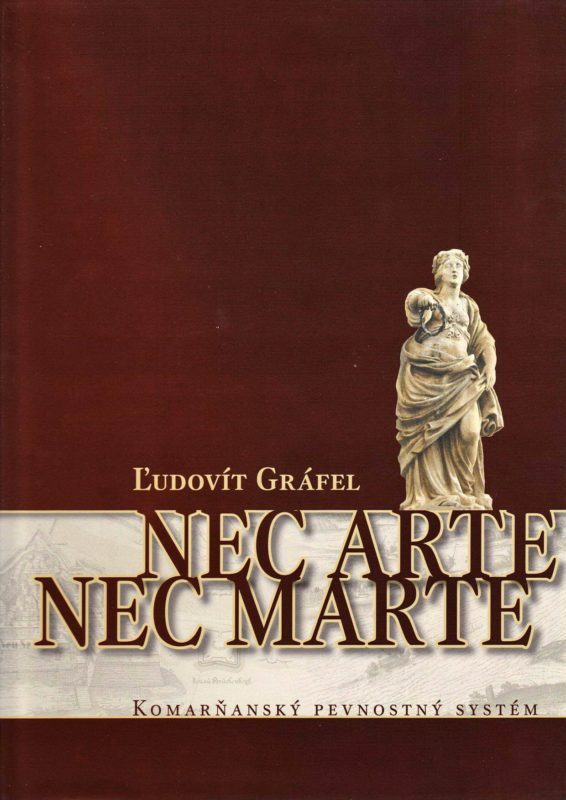 Published: © Mestský úrad Komárno and NEC ARTE s. r. o., 1999, 2006. 66 p.
Photo authors: © Otto Kurucz, Oroszlámos György, Ľudovít Gráfel, Ladislav Platzner, Ladislav Vallach, Mária Sláviková, Peter Frátrič, Szamódy Zsolt, Teodor Nagy, archival documents of Podunajské múzeum v Komárne, Pamiatkový úrad SR v Bratislave, Mestský úrad v Komárne and private collection of Ing. Marián Reško. In recent years, we have witnessed an extraordinary and ever increasing interest in environmental issues and solutions, which is strongly related to the increasing attention in cultural monuments. Cultural monuments determine the fundamental and long-term conformation of the environment. It is needless to emphasize that building and architectural sights play a dominant and primary role in forming our environment. This is fully true in case of the most important cultural monument of Komárno, the extensive fortification system, which has gradually been incorporated in the organic whole of the growing city and determined its urban development. The whole fortification system in Komárno, which has been declared a national cultural monument, represents a significant building complex with relatively well preserved elements regarding historical fortification buildings in Slovakia. However, the diverse use of the individual fort elements, protruding forts and bastions is inappropriate. Not only does it prevent the monument to be presented as a complex or use its large spatial capacities for the benefit of the community, but it also devastates the fortress due to inappropriate intervention. From the view of monumental care, it is a favourable circumstance that despite the destruction and intervention, individual objects can be ideally and practically reconstructed on the basis of their preserved parts. 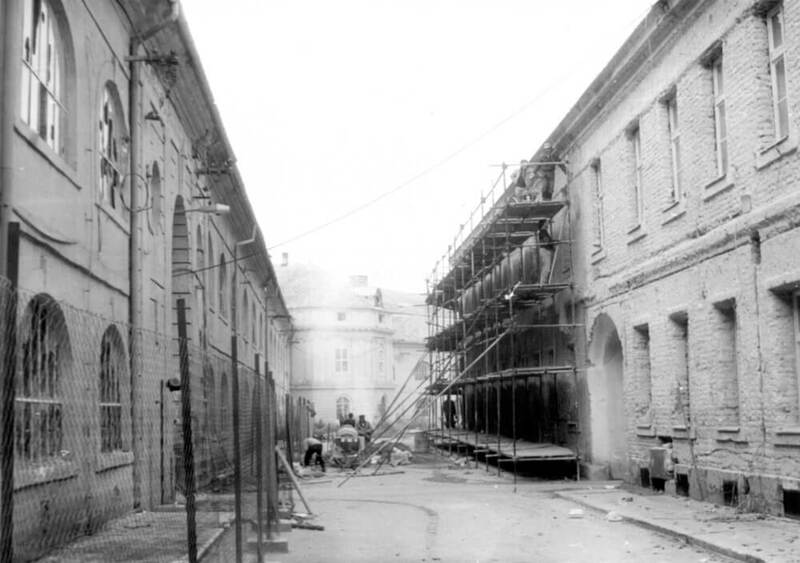 The projects and plans of the former Technical Directorate of Komárno (K.K. Genie Direction in Comorn), which can be found in the military archives in Vienna and Budapest, help us clarify the construction of this huge defence system. 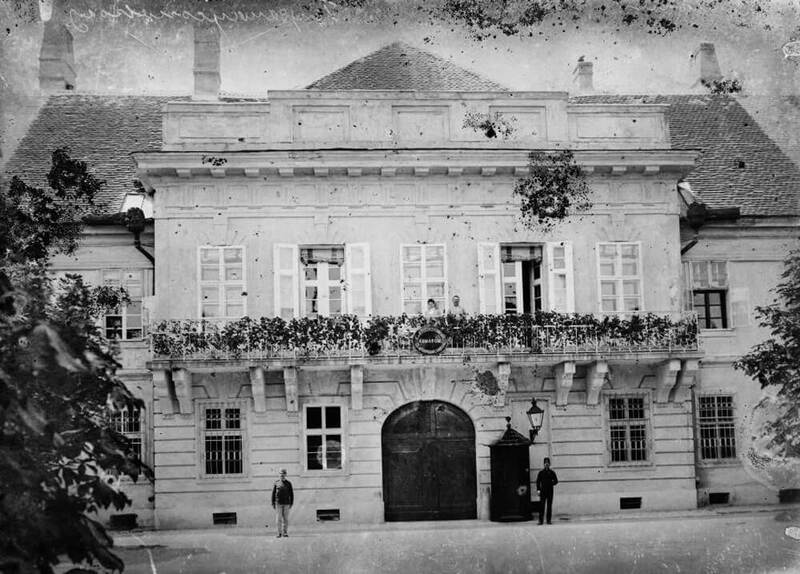 The Directorate in Komárno was established at the beginning of the 19th century and its highest institution was the General Directorate in Vienna (Genie und Fortifications Wesens or Directorium Generalis Rei Militaris Architectonicae). At present, the elaboration of the fortification building from the 19th century is insufficient. Therefore, it is necessary to elaborate and publish the architectural-historical analysis of studies based on the study of historical materials and in-depth field researches. Dear reader, when drawing up the pictorial part of this publication, I used 20 years of knowledge in the form of research, methodology of monument care and direct management of reconstruction works, as well as the presentation of the monument for the professional and the general public. I am convinced that browsing through the pages of this book will motivate and increase the number of admirers of the fortress and also experts who carry out research work in this field. I hope that it will gradually help us discover the secrets that are still hiding behind the walls of the fortresses in Komárno. Because of the trading and military importance of river crossings, they have played a strategically significant role for thousands of years. 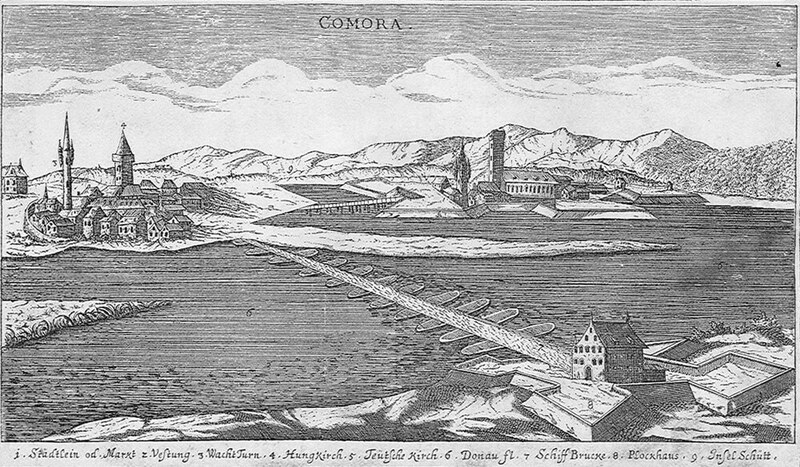 Komárno’s earlier settlements controlled the waterways of the Danube, Váh and Nitra rivers. Not only did they control the rivers, but also the roads that went through the Nitra River valley. This placed the occupants of this junction in a key position. Owning this important international trade intersection (being no other crossing nearby) meant one had power over the region. It is likely, though not proved, that the Romans, who usually secured all the river crossings and confluences, built the first fortress within the Limes Romanus in the location of the present Old Fortress. The area of the present town situated on the right bank of the river Danube belonged to the region of Brigetio (Szőny), which was situated slightly to the east. After the defeat of the German Quadi people, the Roman Emperor Marcus Aurelius also ordered fortresses built on the left side of the river in 171. One of these fortresses can be found 4 km from Komárno, in the region of Iža (Celemantia – Leányvár). The encampment, which was surrounded by earthen ramparts, was built under the reign of Domitianus. These ramparts were later strengthened with stone walls by the soldiers of the first Roman legion. Some centuries later the stone walls of the encampment were demolished, and a significant part of the material was used for the building of the so called “Old Fortress” in Komárno. It has not been proved yet whether a similar Roman fortress existed in the territory of the present Old Fortress. Anonymus (1173-1196) was the first who reported the location of the fortress in Komárno, the inhabited parts of the area and the possibilities of natural defence. 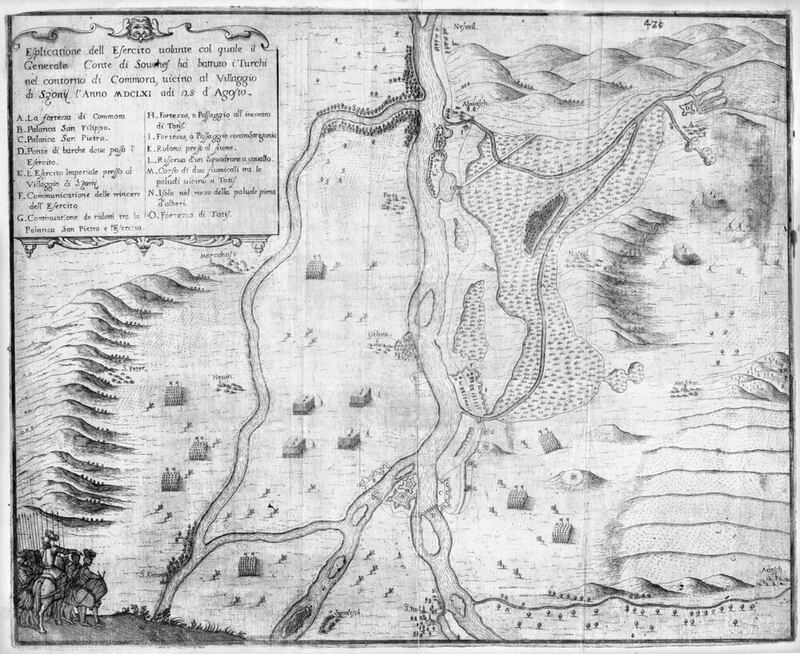 In his book, Gesta Hungarorum, Anonymus says the following about the foundation of the town: ”But Ketel received not only this part but a lot more, as after invading Pannonia Arpad gave him a large area where the Váh flows into the river Danube in exchange for his loyalty. Here, later the son of Ketel, Alaptolma, built a castle, which he called Komárno. He sent two-thirds of the people he brought with him and two thirds of the people he won from the leader to serve in the stronghold of Komárno. After many years Ketel and his son Tolma were both buried in this place.” Komárno was a royal town, near the western border of the country; therefore, it was natural that it had been constantly strengthened and developed throughout the centuries. The Tartar invasion - during which the major part of the country was devastated – proved the necessity of these strengthenings. After the Tartars left the country, King Béla IV strongly supported the developments of towns. He gave significant privileges to 25 settlements, including Komarno, which received town rights in 1265. King Béla IV sold the castle and its estates to Earl Henel. The sons of Henel, however, could not settle their debts, so the king confiscated the castle and in 1265 presented a bailiff called Walter with Komárno and the surrounding settlements. Walter built walls around the castle and the area of the present Old Fortress. However, because we do not have any documents about it, we suppose that these walls were built from stone. Thus we can define the date of the first stone fortress or castle somewhere in the years of 1265-68. Komárno was a royal town, near the western border of the country; therefore, it was natural that it had been constantly strengthened and developed throughout the centuries. The Tartar invasion - during which the major part of the country was devastated – proved the necessity of these strengthenings. After the Tartars left the country, King Béla IV strongly supported the developments of towns. He gave significant privileges to 25 settlements, including Komarno, which received town rights in 1265. King Béla IV sold the castle and its estates to Earl Henel. The sons of Henel, however, could not settle their debts, so the king confiscated the castle and in 1265 presented a bailiff called Walter with Komárno and the surrounding settlements. Walter built walls around the castle and the area of the present Old Fortress. However, because we do not have any documents about it, we suppose that these walls were built from stone. Thus we can define the date of the first stone fortress or castle somewhere in the years of 1265-68. Unfortunately, our knowledge about the castle in Komárno is very insufficient from the 13th century until the reign of King Matthias (1458-1490). In 1317 Matthias Csák (Čák) defended the castle against Charles Robert. The castle was so badly damaged during the siege that it had to be rebuilt. Master Donch, the Lord Lieutenant of Zvolen County supported the building operations financially so much that in 1333 he received the castle in Komárno from the king in exchange for other castles. There are no engravings or drawings from this era, however based on the available data it can be stated that by the end of the 15th century the castle in Komárno with its magnificent palaces became a building complex which satisfied royal needs. Since the siege in 1317, the castle had not been the scene or target of military attack, so the reconstruction and development of military objects became a secondary task. It is understandable that the contemporary architects were first interested in artistic aspects. The Turkish invasion, which lasted for a century and a half, changed the character of the castle and its further development. The royal castle, which was maintained for entertaining the royal court and served as the centre of state offices, again became the most important element of the defensive system of the country and the scene of important battles and sieges. After the invasion of Buda by the Turkish troops in 1541, Emperor Ferdinand I was forced to improve the fortification. He got back the castle in 1544 and ordered its extension. 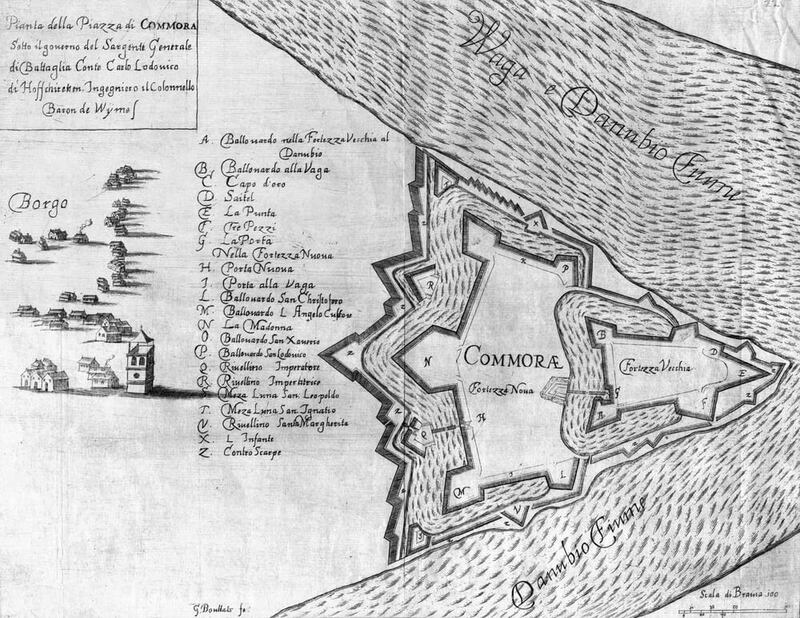 To prepare the plans of the fortress, he assigned Pietro Ferrabosco, who suggested a fort with more angles. This fortification system suited both the contemporary architectural aspirations and the configurations of terrain and hydrography. 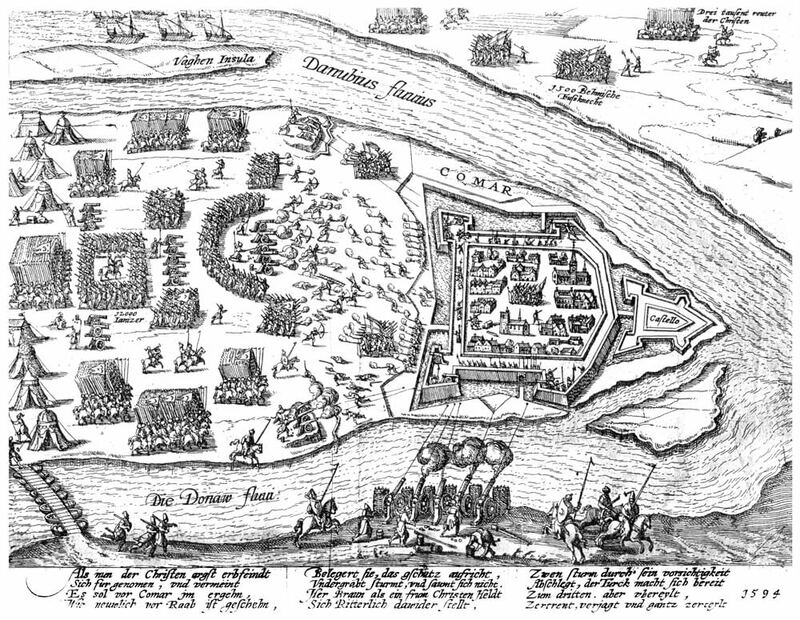 The siege of Komárno in 1594. The year 1527 - when the first bastion was built in Verona – is very important for us because twenty years later, on 23rd March. 1546, they started to build the present Old Fortress in Komárno based on the new experience in fortress building. The building of the fort was directed by Maria de Speciacasa and later Dalmatio Bartolagi and the water constructions by Mathias Dusco, Vencel Cservenka and Paul Puls. The supervisors of the constructions were Michael Schick between 1546-1551, Leonhard Müller from 1550 and Francesco Begnino after 1552. The fortification work was directed by Domenico Castaldo in 1551. Emperor Ferdinand I asked Castaldo to build the eastern part of the fortress rapidly. The supreme command decided during the process of construction that for the benefit of better defence of the town, they would erect a palisade on the banks of the rivers Váh and Danube opposite the fortress. However, the palisade, which was able to hold 100-200 horsemen, was constructed only in 1585. The Old Fortress took ten years to build. According to the reports of Francesco Begnino in 1557, only the earthen ramparts needed to be improved and the water ditches deepened. The plaque above the gate of the Old Fortress with the year 1550 most probably signifies the year when the gate was made. It is likely that the architects of the fortress didn’t have enough experience and knowledge about the quality of the soil in the area as – according to the report of the architect called Urban Süess – in the spring of 1570 the flood destroyed most of the walls. Under the management of Urban Süess the fortress was rebuilt between 1572 and 1592. Famous experts from abroad such as Daniel Speckle from Germany and Carlo Theti from Italy also cooperated on these projects. The new, improved and rebuilt fortress stood the test in 1594 when Sinan pasha surrounded it with his huge army and besieged the fortress for a month but couldn’t capture it. We have a precise ground plan from 1572, which proves that the shape of the external bulwark hasn’t changed since then. The fortress, which extended from east to west and was separated from the town by water ditches, had five bastions. Out of these five bastions, the eastern bastion was the biggest; it served to protect the confluence of the Váh and Danube Rivers. The main gate was located on the west side of the fortress, near the southwest bastion. The huge stone walls of the fort emerged from the wide and deep ditches. The earth taken from the moat was used to build the external entrenchments around the fort, which protected the walls from cannons fired on a flat trajectory. The cannons placed on the protruding bastions (“Italian bastions”) protected the moat, the side and front wall of the adjoining bastions as well as the walls between two bastions. 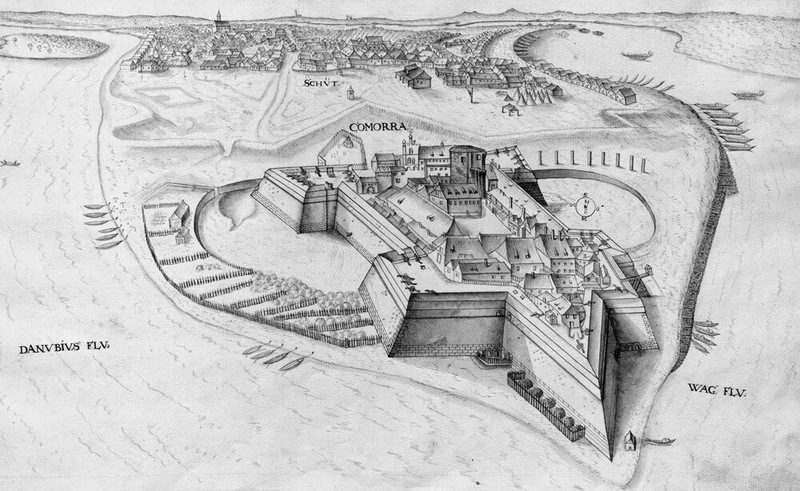 After the Turkish military expedition in 1663-1664 and because of the fall of the forts in Nové Zámky, fortification became important again. King Leopold I ordered the building of two new forts. One of them was Leopold Fort near Hlohovec; the other was the New Fortress in Komárno. The fort, which was named after him, was built in a very short time between 1665-1669. The New Fortress was constructed between 1663-1673. The thought of expanding the Old Fortress was proposed earlier by Carlo Theti, the famous architect in 1570, and he drew up two versions. However it took quite a long time to complete it. The first phase of the building process ended in 1663. In this year the entrenchments were built. Then the entrenchments were rebuilt from stone and brick.The works – based on the plans of General Franz Wymes – were accomplished using the most up-to-date Italian and French work experience. The New Fortress, which was built with great ornateness, was completed in 1673, according to the plaque above the main gate. The western bastion and southern parts were built from solid building material, while the north wing was built from earth. The copper engraving prepared by Bouttats Gaspar based on the plans of Franz Wymes enables us to see what was the fortification system like. This engraving contains the list of some of the parts of the fortification system in Italian. According to this, the Old Fortress remained in its original shape as it was built in the 16th century. Only the water ditches were deepened and enlarged, dividing it from the New Fortress. In front of the main gate of the Old Fort, an irregular rampart was erected with a broken entrance route which protected the entrance of the fortress. The New Fortress was built to protect the Old Fortress. It was built on a larger area than the old one, also in the shape of a pentagon, and its two eastern bastions were freely attached to the two western bastions of the Old Fortress behind the water ditches. Out of the five bastions of the New Fortress, the western bastion is the largest – the middle one with its head pointing towards the town. Both to the north and south there were ramparts from which the southern rampart with a drawbridge had to protect the main gate of the fortress. 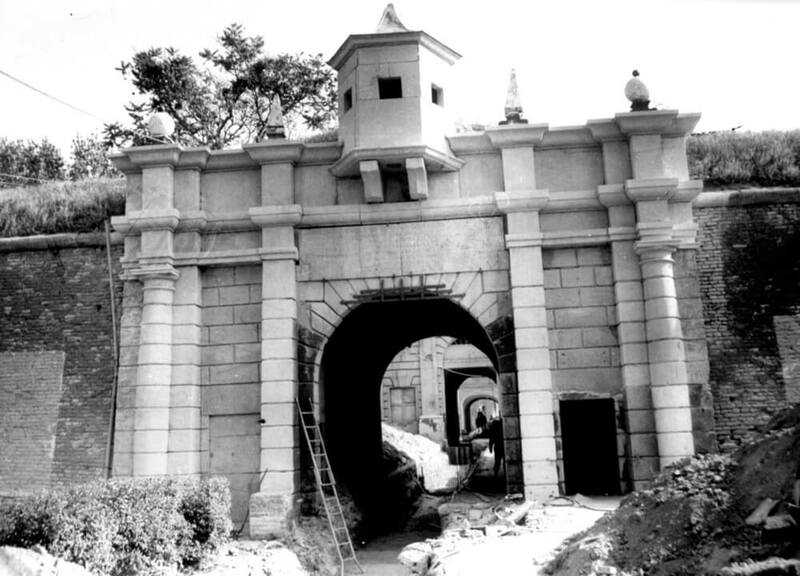 The gate was situated in the middle of the fort wall between the western and southern bastions. The wide moat around the peripheral walls followed the shape of the New Fortress. There were casemates in the ramparts and several gates for attacking the enemy. At that time on the bulwarks around the Old and New Fortress the peripheral side of the ditches was built, the so-called contraescarpment. Inside the earth ramparts, in some places protected routes and meeting places were formed. Together with the other buildings in Komárno the enormous fortress couldn’t escape its fate and was badly damaged in the flood in 1682. At the command of Leopold I, a huge amount of money and a regiment of soldiers (Dippenthal regiment) was sent to Komárno to repair the fortress. The renewed fortress survived the last Turkish siege in 1683 when the soldiers of Imre Thököly, allied with the Turkish troops, besieged the fortress unsuccessfully. 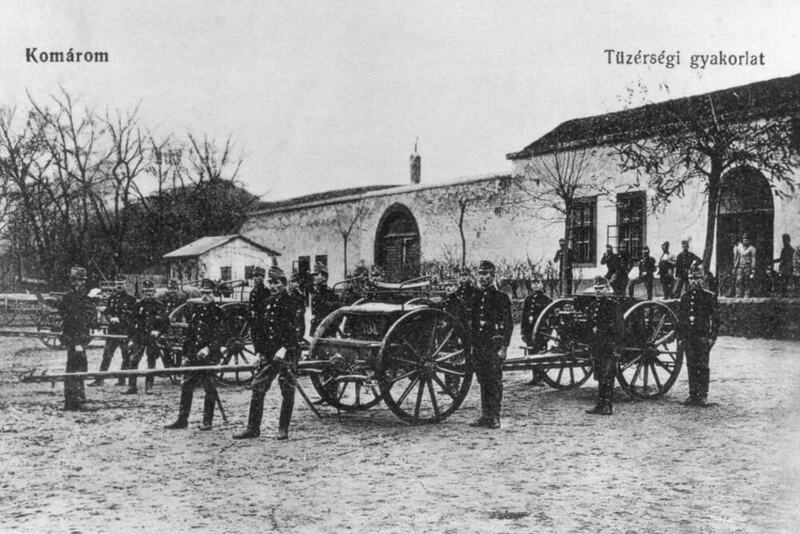 The Turkish troops were defeated in the same year at Vienna and after the war, which lasted sixteen years, Hungary was liberated from the Turkish rule. It was a turning point in the fortress’ life in that Komárno also ceased to be a border town and was not highly maintained. The earthquakes in 1763 and 1783, the epicentre of which were near the fortress, destroyed it a great deal. As the military management did not find it important to restore the destroyed fortress, the garrison of troops was depleted. The sites on which the fortress was located, were donated to the town by Joseph II, and the buildings were sold by auction in 1784. The renovation of the fortress started again in 1808 due to the Napoleonic Wars. The Old Fortress and an eastern view of the city with the earth ramparts between them, built in 1528. The effects of the Napoleonic Wars on the Habsburg Empire caused the emperor to realize that significant army posts were needed along the river Danube. This turned attention to Komárno again. In 1807 the engineers did the necessary surveying, made plans and restored the central fortress. At that time the northwest wings which were built from earth, were rebuilt from bricks. This can be called the third phase of the building process of the New Fortress. The work started on 20th August 1808 and finished the same year on 4th September. The speed was really necessary as the Austrian dynasty found shelter amongst the walls of the fortress after Vienna was captured by Napoleon. In 1810 in the court of the New Fortress huge barracks were erected in a U-shape, and on the southern side of its interior military headquarters were built in 1815. Some repairs have been made to the fortress during the centuries, but the original shape of the fortress remained unchanged. Between 1827 and 1839 the interior of the Old Fortress was changed a little bit, during which a system of new casemates was formed in the walls of the fort. In the 19th century the defensive forts gradually became out-of-date due to the development of the artillery guns. 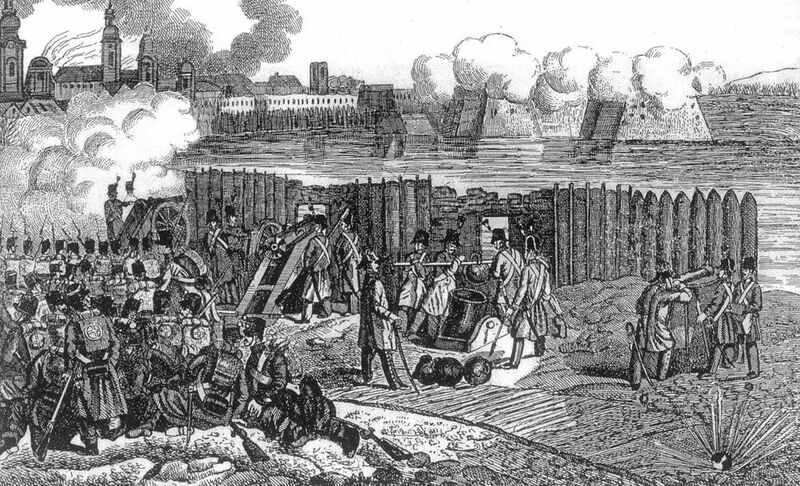 By inventing a more effective artillery in 1859, the centre of defence was transferred to the protruding forts. The gun-lock was also invented at that time, which made it possible to fill the guns from the back. The invention and usage of more effective explosives (pyroxylin, nitroglycerine, melinite and trotyl) also modified the strategic methods. The development of firearms also caused major changes in the warfare. Early in the 19th century the rifle-range of the hand-guns which were filled with “black gunpowder” was about 100-200 meters while at the end of the 19th century magazine arms were used whose effective range was about 2000 meters. 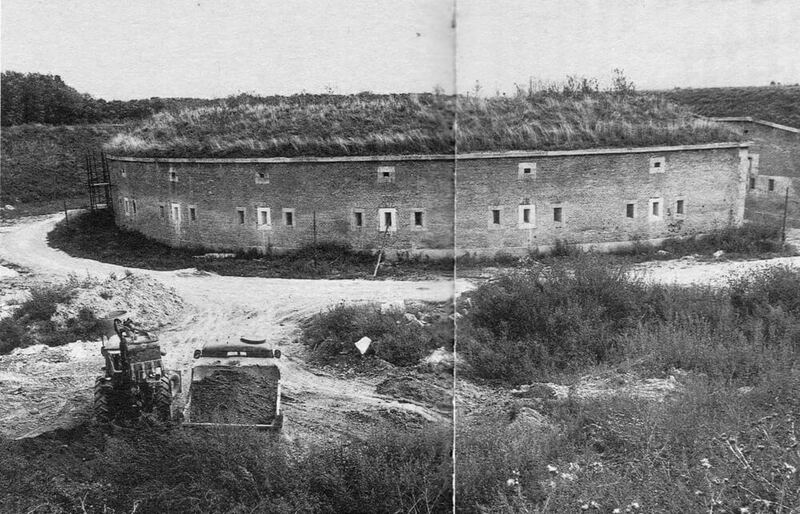 Based on the above mentioned military achievements, it can be stated that the fortification system in Komárno was the last strength of the contemporary warfare, but after a few years of its building it also became out-of-date. 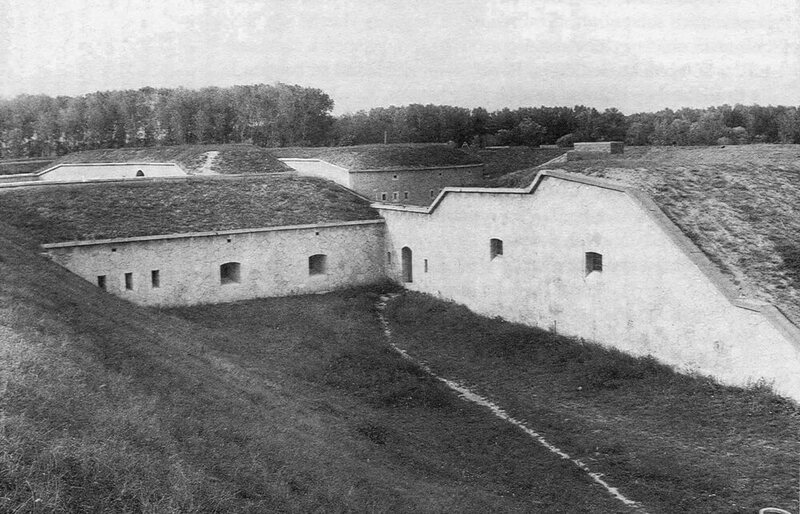 By shifting the defence centre, a new type of fortress was invented in the 19th century which can be divided into two main elements, namely the central fortress (citadel - in the case of Komárno, it means the Old and New Fortress) and the protruding forts, respectively the chains of fortifications. In 1809 an enormous defensive ring was built. Between the Small Danube and the Apály island, this chain of fortification was built from earth. It went well past the town walls built in the 17th century. The fortification work was conducted by the palatine of the country and that part of the fortification system was named Palatine Line for him. At that time colossal plans were prepared but the original plans according to which the fortress could house 200.000 soldiers changed a lot during its completion. 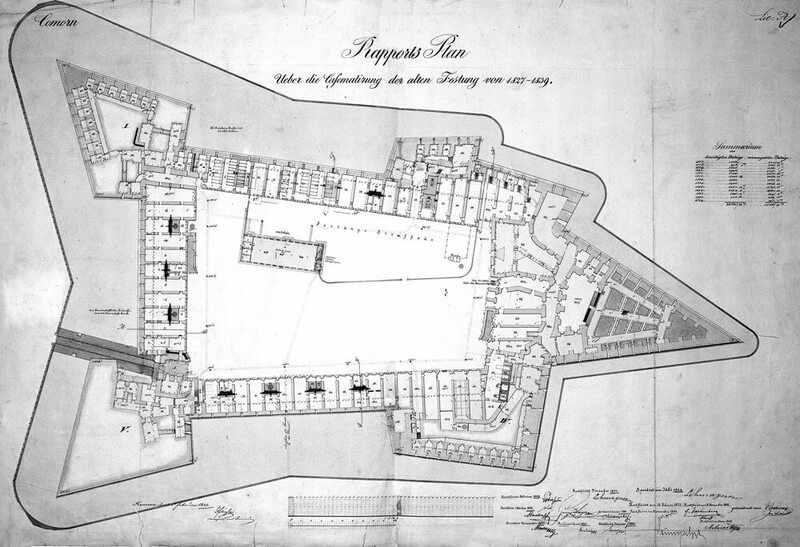 The first plan dates back to 1810. Unfortunately it could not be finished, as it required a large sum of money. 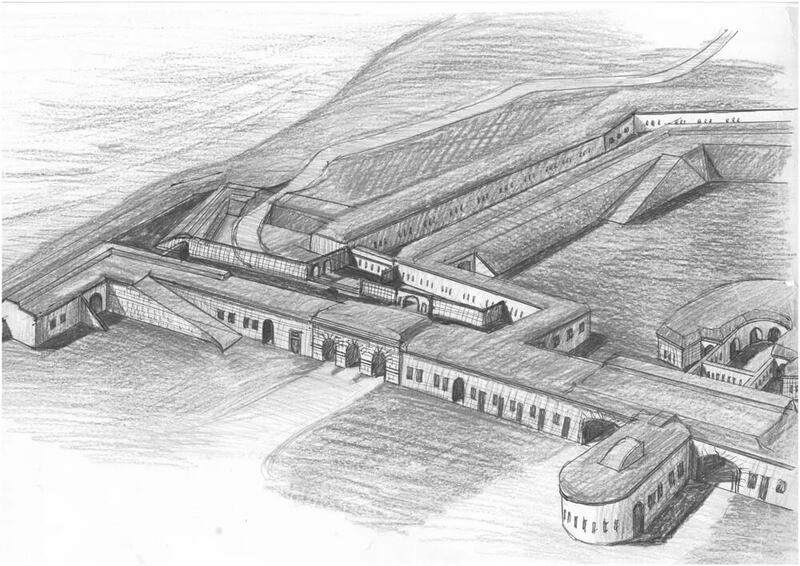 However, it was significant from the point of future plans, as it encouraged other architects to work out further plans played a significant role in the final formation of the fortress in Komárno. The subsequent plans were a lot more modest, and they correspond to the shape of the present fortification system. For the next construction project, four out of the six bastions on the Palatine Line stayed in the foreground temporarily probably to ensure the protection of the town in case of a military attack. After the preparatory work, the final construction work started, during which the enormous fortification line was built from stone and brick. Five bastions and the walls of the fortress which connected the bastions were built between 1839 and 1847. The sign “1844” which can be seen on the east façade of the Bratislava Gate next to the first bastion, does not indicate the beginning of construction work but the year when the gate was built. The function of the defence line, which was built about 2-2.5 km from the central fortification, was to protect the region between the rivers Danube and Váh. The five bastions are connected with walls and other ramparts so the building complex forms a closed line. All the bastions have a pentagon shape. There is no doubt that the Palatine Line is a perfect example of the contemporary fortress architecture, as during its building all the knowledge was applied. The Palatine Line also represents a transition between the old fortification system and up-to-date defence form. The five bastions of the Palatine Line are basically the same; they only differ to a minimal extent (different angles, forming the corners and the angles of refraction of the retranchment wings). These differences are not because of the features of the ground but because of ”the relations of the bastions to each other” (the protection of the adjoining bastions etc.). The designers validated Daniel Speckle’s basic principles, according to which the side walls of the bastions had to be perpendicular to the defence line of the adjoining bastion. This basic principle was validated to the full extent in case of the first three bastions, while in case of the fourth and fifth bastions it was only partly followed. The defence line is parallel with the water ditches which connect the adjoining bastions; on the wing, which leads from the adjoining bastion to the bastions between, it corresponds with the line of the counterscarp. The walls which connect the two bastions are broken a bit in the middle, thereby dividing the wall into two wings; at the breaking a bastion was built on which a gun-emplacement was formed. On the walls of the fortress they placed two batteries on each of the right and left wings of the walls and the third was placed in the centre of the middle bastion. The batteries stood out from the walls so that from the middle bastions the defenders could open fire at the enemy from two floors. The walls between the batteries are lower and there is a narrow path there. In the walls there is a wide passage which connects the adjoining bastions. The passage was divided into 23-23 halls, from each of which four loopholes faced the ditches. Two sets of three casemates with four loopholes each were connected to the two passage wings. In case of full usage of the passage in the region between the two adjoining bastions, 200-210 guns faced the water ditches out of the loopholes of the escarpment. The length of the escarpment between the two bastions was about 2 x 185 m.
Apart from bastion I, the bastions of the Palatine Line are all symmetrical. 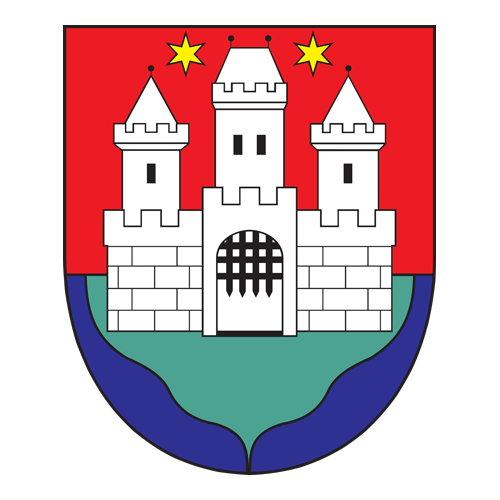 The asymmetrical shape of bastion I is explained by its function, because it had to protect not only the bank of the river Danube but also the main gate of the town (Bratislava Gate) due to its position. The groundplans and sizes of bastions II and IV are exactly the same. Bastion III was the central bastion of the Palatine Line. Its ramparts and walls enclosed an angle that was more blunt than the adjoining bastions’angle. In the left wings of the earthen ramparts of bastions I, II and III, two-storey ammunition depots were established. In the conception of building the Palatine Line, they tried to blend the defence elements developed in the 16th and 17th centuries (heavy artillery defence on the façade, reinforced side parts) in one complex defence system. The walls of bastion II, which form a blunt angle, surround an empty interior. Its main part consists of the retranchement and a semicircular building, which has seven artillery casemates. 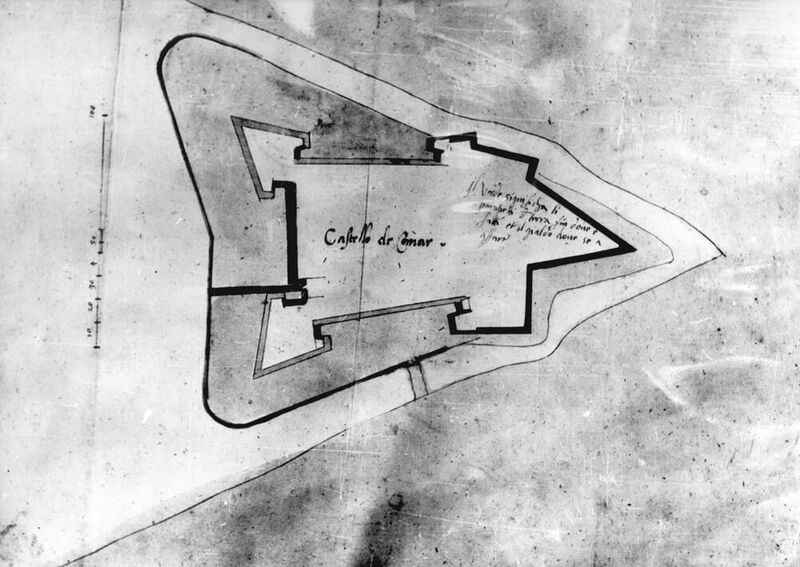 The name “retranchement” was given and used by a famous French military engineer, Vauban, who planned this fort element in the second half of the 17th century. The two symmetrical wings of the retranchement closed an angle of 173° towards the forefield. Its side-wings stick out towards the body of the fortress, closing the gorge from inside. The width of the bastions in the Palatine Line is approximately 210 meters. Let’s see now the main measurements of bastion II for a more accurate orientation: gorge 210 meters, side-walls of the bastion 60 meters, front walls 108 meters, the front walls close a 145°-angle at the salient, and a 110°-angle at the corners. The height of the escarpment from the level of the ditch to the cornice is about 7 meters. The walls that strengthen the ramparts of the bastion are connected with the protruding side-wings of the retranchement. There is a gate on both sides of the retranchement. The interiors of the bastions in the Palatine Line are empty (not having been banked with earth), the width of their earth ramparts is approximately 23 meters, and a 10 meters –wide pathway was built on them for the cannons. We can approach the pathway from the interior on the side-ramps. The length of the route between the right and left flank of the bastion through the passages formed in the side of the contraescarpment is 540 meters – exclusive of the length of the retranchement. The length of both of the wings of the retranchement is 70 meters from the capital, 140 meters altogether. The protruding wings, both with lengths of 20 meters, are joined to these. Adding up the above mentioned figures, we can state that the length of the passages and casemates of a bastion is about 720 meters. If we add to this figure the length of the passages of approx. 370 meters formed in the fort walls which adjoin the bastions, we can conclude that the total length of the passages and casemates of the Palatine Line is about 5 km. Finally, we can state that the Palatine Line originates from uniting the previously developed, independent fort elements. 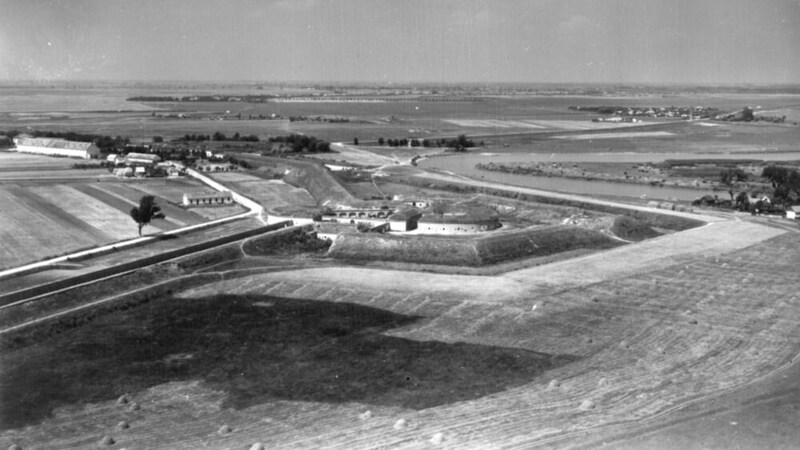 The large number of loopholes formed for the small arms ammunition and heavy artillery emplacements, as well as the huge capacity of military quarters, acknowledge that the Palatine Line was a unique masterpiece of its era. 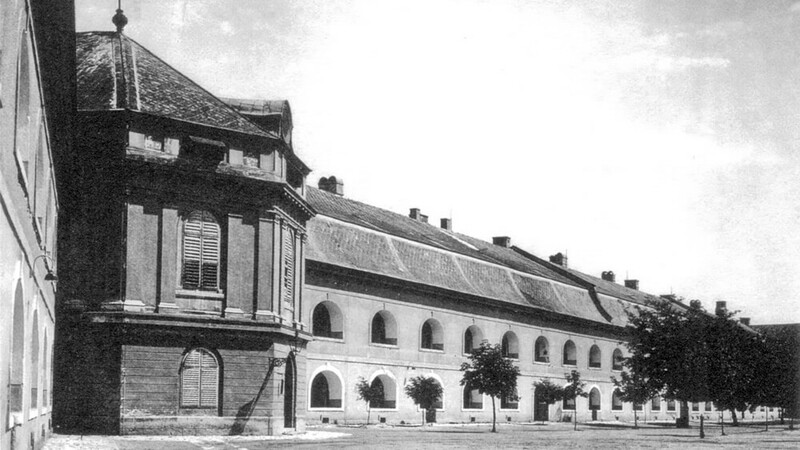 The Váh Line was built in the 1860’s, almost 20 years after the building of the Palatine Line. It is reflected in the conception and solution of its construction. Influenced by the Austrian-Prussian war in 1866, the building work speeded up. The chain of fortifications consists of six main fort elements (VI., VII., VIII., IX., X., XI. ramparts – batteries), out of which only the first two are considered as bastions (VI., VII. ramparts). The Váh Line compared with the Palatine Line is more modest in its design because of its location as it spreads along the river Váh. The river actually represented an advanced defence zone. The walls which connect the fortifications are also simpler. A tall, steep earthen rampart forms the defence line towards the city. It is then followed by a water ditch which is bordered by a fort wall from the inner side. Loopholes based in the stone walls face the ditches. 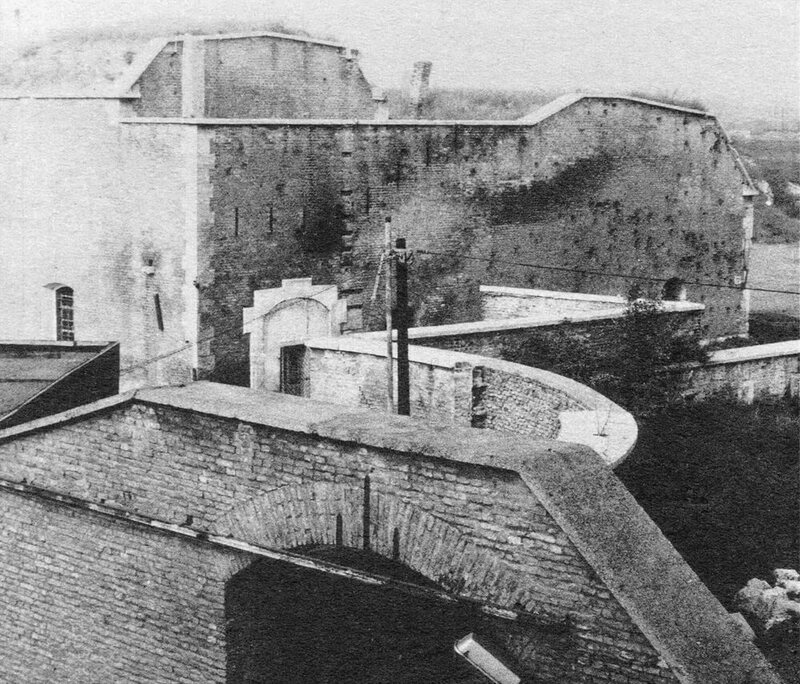 Except from the loopholes, the protection of the ditch lengthwise was also ensured due to the heavy artillery casemates based in the sides of bastions VI and VII. The heavy artillery casemates which connect the fifth and sixth bastions played a similar role. The walls of the Váh Line are also repeatedly broken from the seventh bastion towards the central fortress because the gun-emplacements based in the bays ensured the protection of the walls lengthwise. This section is divided by buildings with simple, symmetrical and rectangular groundplans and narrow courts. We can conclude from the openings in the buildings [entrance, windows, ventilation] that they were mainly used as arsenals. The cannons were placed in the four big halls of the building. The entrance gates of the building led to the court. 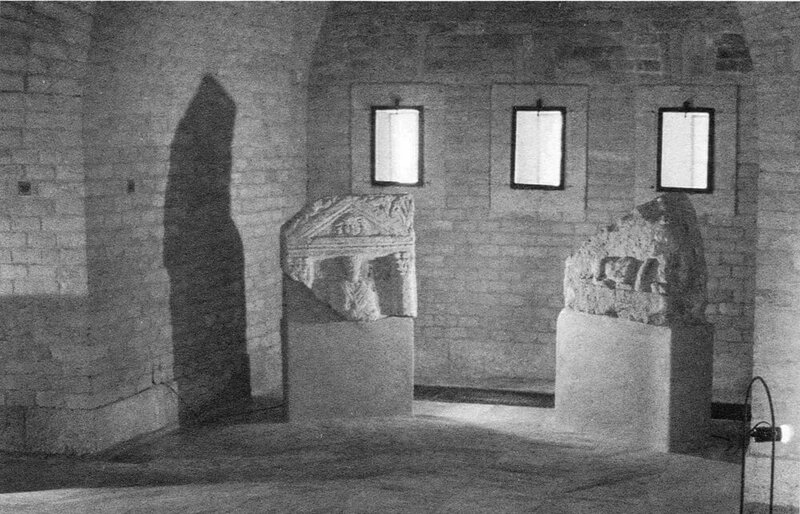 The four smaller rooms of the building most probably served as quarters for the commanders and the guards. The windows of these rooms overlooked the town. Only those parts of the arsenal which overlooked the town served as quarters for the soldiers. The gate and some casemates of the last, the XI rampart of the Váh Line, survived in good state. Its function was to close the defence line and at the same time connect the external ramparts of the New Fortress with the Váh Line. An earthen rampart spread from the right wing of the New Fortress towards the confluence of the Danube and Váh rivers. It went as far as the eastern bastion of the Old Fortress. In the inner part of the Váh Line, between the eighth and ninth ramparts, an independent rampart was built which was marked as VIII ½. This battery position, which could be approached from two ramps, enabled one to shoot at further points in the forefield, thus increasing the efficiency of defence of the Váh Line. As early as 1555, the war councillors planned to build a palisade on the left bank of the river Váh, which would be connected to the Old Fortress by a pontoon bridge. However, the war council passed a resolution only in 1577 to build a palisade which could hold 100 horsemen. The work started in 1585. In the first decades – and even in 1649 – the building was called St Nicholas and later St Philip palisade. It was demolished in 1661, as it did not suit the requirements of that period, and in its place a new and stronger palisade was built. In the second half of the 17th century the Jesuits built a chapel in honour of their saint. 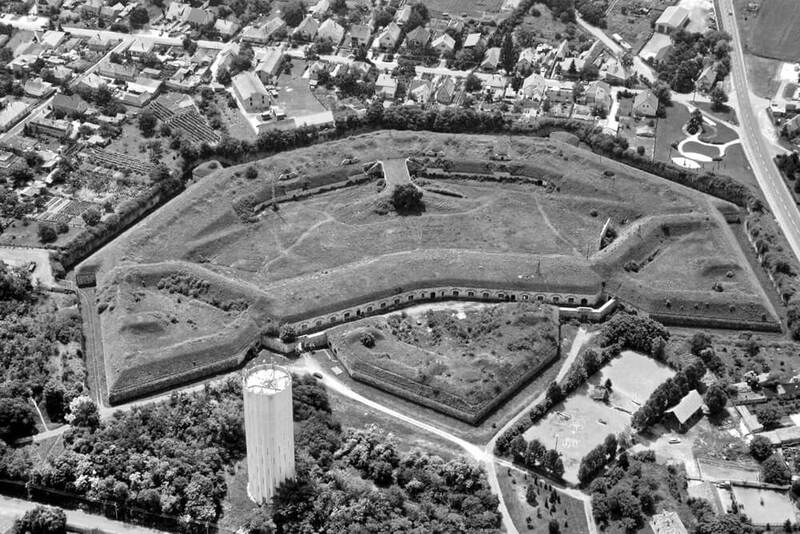 In 1866, when the biggest work was done, the central part of the fortress was the star-shaped fortress. The rest of the ramparts were probably located according to the previous plan of the palisade. The highest level of the bastions (upper terrace) was asymmetrical due to the cuttings in the salients (summits of the bastions). At the highest point of the bastion, where two ramps led, a gun-site was placed. The upper terrace could also be approached on two ramps. In the central fortress a four-winged, rectangular shaped closed building complex was built, which most likely served as a barrack. From two sides of the star-shaped central fortress - toward northwest and southeast - a chain of fortifications spread, with three bastions in both directions. This chain of fortifications spread from the bank of the Váh toward bastion II of the central fortress, while on the other side of the fortress it spread from bastion III toward the mouth of the river Váh. 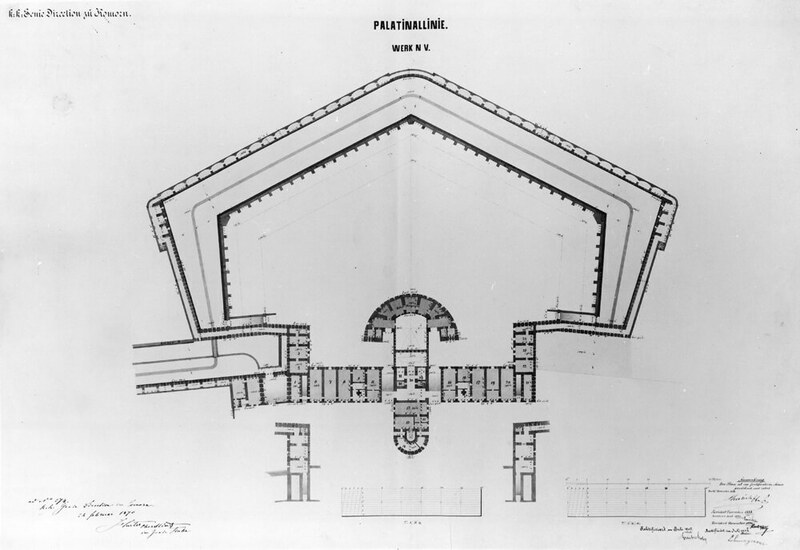 The plan of the bastions was asymmetrical pentagon or hexagon. On the ledges of the upper terrace gun-positions were built. The bridge-head could be approached on a pontoon bridge from the central fortress. Unfortunately this bridge-head can be only seen in ruins now. The other ramparts were probably placed according to the plan of the previous palisade. The Danube bridge-head (Fort Star) is situated on the right bank of the river, opposite the eastern bastion of the Old Fortress. It was built at the same time as the Váh bridgehead. In the second half of the 17th century the Jesuits also built a chapel here, commemorating St. Peter. This fortress was also neglected after the Turkish rule ended. However, the bastions built from earth were still there in 1810. The fortress played a significant role during the fight for freedom. Later, between 1850 and 1870, it was rebuilt from stone and brick as one of the most important elements of the new defence system. Its origin is closely connected with the defence of Újszőny [the present Komárom] against the attacks from the west. 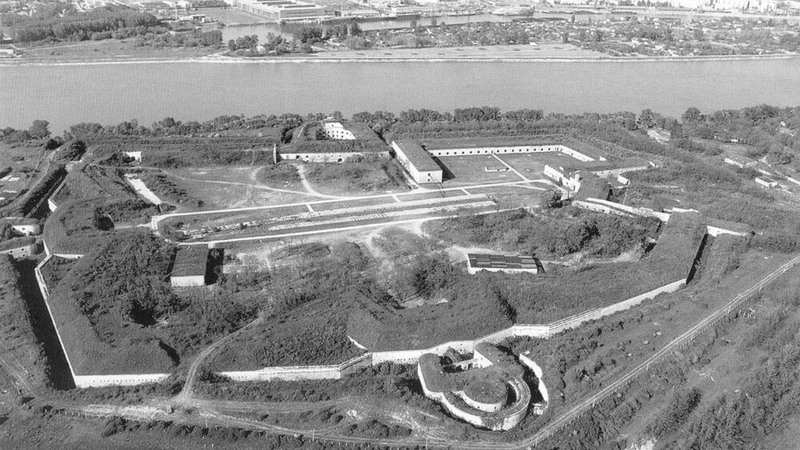 The fortress was planned to be built opposite the western corner of Elizabeth Island, on a sand hill on the south bank of the river Danube. 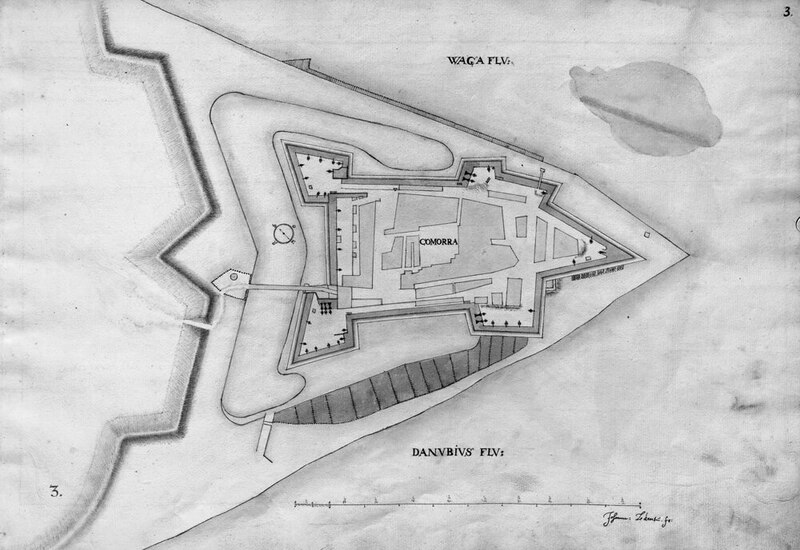 The area needed to build the fortress – which was in the possession of count Zichy – was taken by the Treasury in 1817. 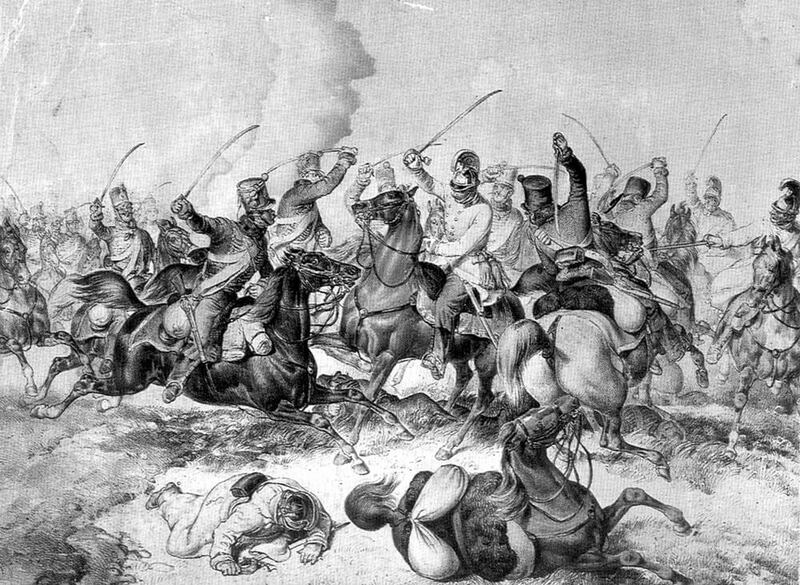 In June 1849 at the command of György Klapka, then commander of the army and the fortress, the sand hill at Monostor was strengthened. One thousand two hundred bricklayers and 10.000 subworkers worked on the site. The enormous Fort Monostor was built only after the fight for freedom (between 1851 and 1871) according to the original plans. Fort Igmánd is the most modern and most southerly element of the fortification system, which was built to protect the south entrance of the town. It was named after Igmánd, a country town nearby. In this area an earthen fortification was erected, which was strengthened by a stockade during the fight for freedom in 1848-1849. Later it was demolished and another one was built on that site between 1871-1877; it became an inseparable part of the new defence system. 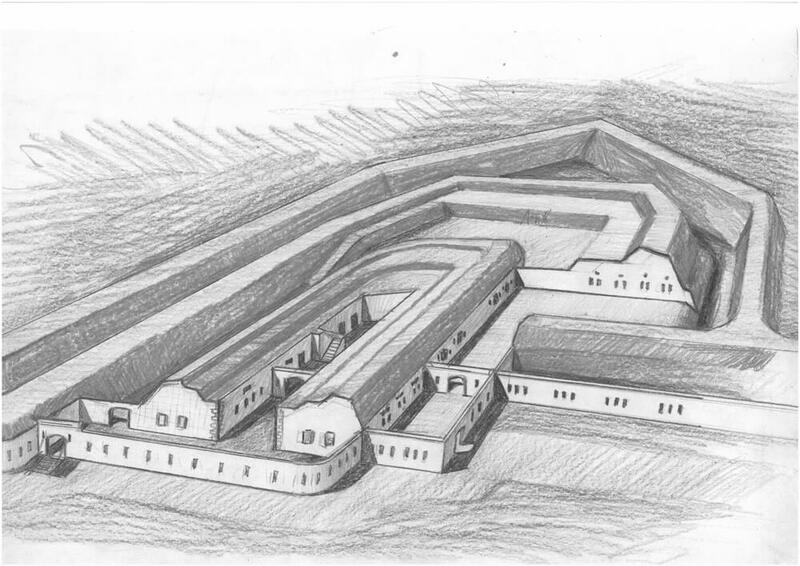 With its completion the enormous fortification system was finished in Komárno-Komárno. Following the architectural theories of the time, the thickness of the fort walls ranged between 70 and 500 centimetres. In some places where the walls are damaged, we can see the ballast which forms the central part of the walls. On the outer side this was girded with one or two layers of brickwork. From bastion I as far as bastion VII, the walls overlooking the esplanade were built from stone, and the walls facing the town were built from brick. All the escarpments and contrascarpments were built from stone. The blocks of stone in both cases fit tightly to each other, which indicates perfect stonework. The foot of the brick façade was always covered with stone and the corners were strengthened with built-in stone cubes. The perfect fitting of the bricks at the vaults of the gates and windows helped emphasise the pointings, increasing the aesthetic effect of the building. Generally the brickwalls were not covered with whitewash made from lime, but in some cases they were covered with a thin layer of ochre-coloured whitewash. In those cases the pointings were emphasised with a pale grey colour. The front walls are closed with a ledge built from red limestone. Complex building methods were applied due to the material requirements of the defence system. Stone (limestone) and bricks were the buiding materials of the walls. The crowning cornices, the frames of the gates, windows and doors as well as the footings and the stone-plates indicating the serial numbers of the bastions were all made from red limestone. The architects pursued simplicity and purpose, emphasizing the stability and greatness of the building complex. The loopholes on the facade, windows, doors as well as the aerators are repeated regularly. All the rooms are vaulted. Other artwork must be also mentioned, for example the forged gates and grating. The vaults of the gates, which close the passages of the fortress and the central courts, are mostly round-arched. Under the vaults semicircular, stable, radial or concentric lattice was placed. The wings of the doors were made from juniper, and their opening was facilitated by lead rails. The ground-plate was paved. The gates of the inner halls were not decorated, and they closed with huge iron bars. The process of the brackets that held the gates was not complicated. All the openings of the inner rooms, which faced outwards (windows, doors, loopholes, aerators), could be locked up. The lintels of the rectangular windows are segmental, their stone frames not embellished. In some places the original window-frames and glazing remained. All the windows have simple iron lattice. In some places above the loopholes we can see semicircular openings which ensured the ventilation of the rooms as well as some feeble lightning. In the heavy artillery casemates the openings above the loopholes filled the function of the aerators. Otherwise, apart from the above mentioned facts, the ventilation was provided by the central vents, which were built in the ceilings of the passages. The vaults of the cannon loopholes are segmental; on the forefront it was emphasized by voussoir. The cannon loopholes were closed by heavy wrought-iron lattice, which in some places can be seen even today. We can see right-angled holes on the inner edges of the frames of the loopholes, probably for the constructions that closed the openings. The stone frames increased the aesthetic effect of the building. All the work done by bricklayers and other craftsmen was carried out on a very high standard. The fortification system also represents the political and social conflicts which were characteristic of that period and the technical processes at that time. Two worlds are encountered here, both the industrial production and capitalism which had gained more and more ground. 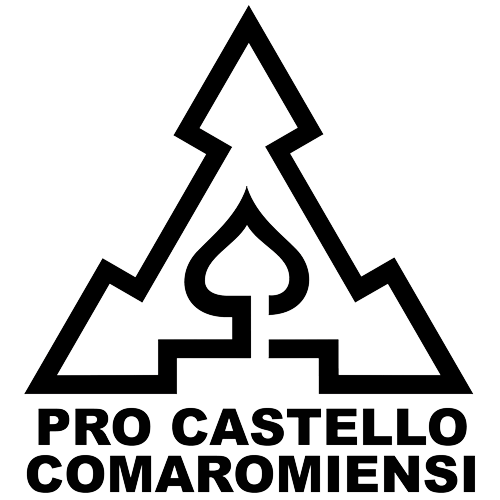 The symbol of this is the relationship between the railway and the fortress. With the development of capitalist production and trade, as well as improvement of the firearms by the end of the 19th century and especially by the beginning of the First World War, the fortification system became completely outdated. Even though some parts of the fortification system were demolished and the defensive ring was destroyed as early as the first half of the 20th century, the whole building still exists. Some parts of bastion I were also demolished; only Bratislava Gate and some parts of the retranchments survived. The fort wall between bastions II and III was demolished due to road construction, while the section between bastions III and IV was knocked down when the railway that leads to Gúta (Kolárovo) was built. Quite a long section of the walls between bastions IX and X of the Váh Line has also disappeared. The area of the Old and New Fortress was occupied by the soldiers of the Soviet Army between 1968-1989. During this period the state of the buildings there deteriorated a great deal. In parts of the Váh and Palatine Line various industrial, agricultural warehouses and industrial plants owned by private companies are currently being operated. This, of course, doesn’t have a good effect on the condition of the buildings; and even in their usage it does not represent an ideal solution. The unusually extensive fortification system in Europe with its good geographical position and quite good condition requires the implementation of a plan which, apart from saving valuable monuments, would ensure the satisfaction of the demands of the great masses of the people. A very important aspect is that building institutions other than that in the fortress would be a more demanding task both in terms of time and money. The theoretical choice of the suitable buildings, which would correspond to the common purposes, has already been made, but some changes are feasible regarding the technical condition of some of the buildings. In the objects which most evoke the original states of the buildings, the operation of museums seems to be the most reasonable use. We have to ensure that in the future the fortification system would become a leisure centre that would be part of the citizens’ everyday life in Komárno. At present, the evaluation of the plans and the determination of the future function of the objects are in process. The final decision depends on the social and communal expectations and the ideas of the future renters. 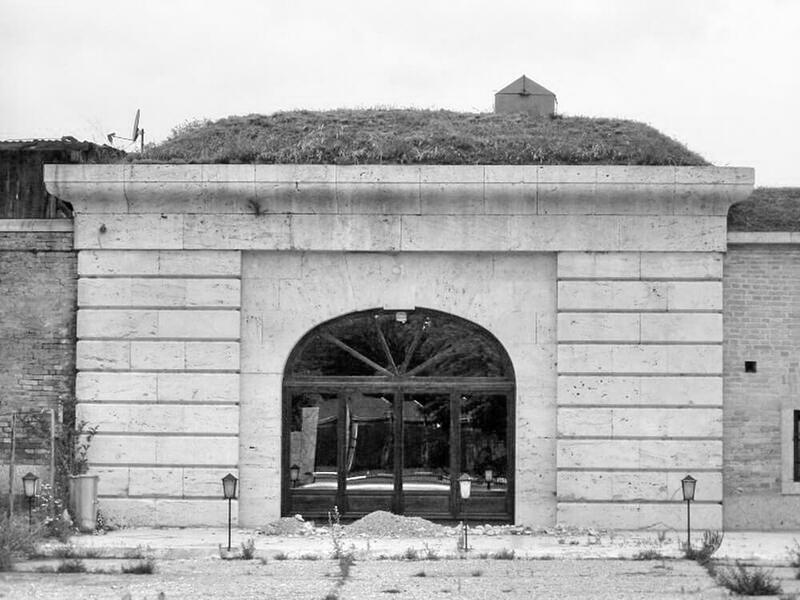 A similar readiness can be seen in South Komárno, where the local government has taken effective steps to redevelop Fort Igmand, Fort Csillag (Star) and Fort Monostor. In Fort Monostor - which some years ago also served as a garrison for the Soviet troops – presently there is a museum, a conference hall and a restaurant. As we have already mentioned, the plans of the bastions of the Palatine Line are identical; however bastions VI and VII of the Váh Line are unique. When planning the restoration of the buildings, our primary target has to be maintaining the basic types, which means the restoration of the casemates of bastions V, VI, VII and those between bastions V and VI. During the restoration work, special attention was paid to the damaged ramparts which were restored according to the original documentation. In this way the ramps and the protected paths for the artillery became easily recognizable. When clearing away the silt and other dirt, which has gathered during the years, the original well, water-system and lavatories were found. Even changing the function of the rooms, these things can be seen in their original state. Recently we have been witness to successful restoration work of some entrepreneurs who have rebuilt some parts of the fortification system with their own capital and with their purpose in mind. In this way they have contributed to the saving of our cultural heritage. We can mention as a positive example bastion I and Bratislava Gate, bastion IV, as well as bastion V, where there is a private gallery. As the fortification system should serve mainly tourist and entertainment purposes, the best solution would be to establish a so-called historical-educational path between bastions IV and VII. The route of this path would go through all the important elements of this architectural masterpiece: the water ditches, artillery and adjoining passages, heavy artillery casemates, walls of the fort and protected paths. In this way the interested public might be able to study and examine this last creation of traditional fortress building of the 19th century, which is unique in our country and Central Europe. Svaz čs. rotmistrů – odbočka v Komárne. 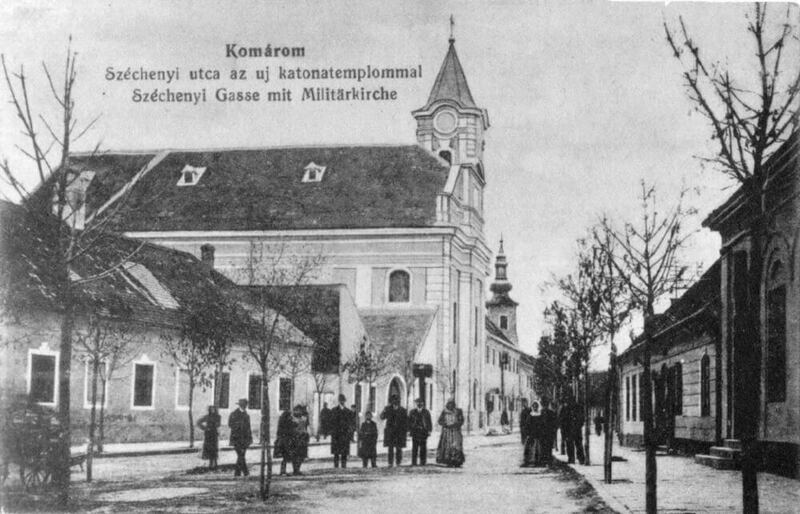 Komárno 1930. Kurucz-Tóth János: A leányvári ásatások folytatása. A Komárom Vármegyei és Városi Múzeum Egyesület Értesítője, Komárom 1907., 1908., 1909. Lichner Ján: Stavebný charakter mestských hradieb a opevnení za čias tureckého nebezpečenstva na Slovensku. Vlastivedný časopis XIII/1. Bratislava 1964. Komáromi Lapok XXII/30. 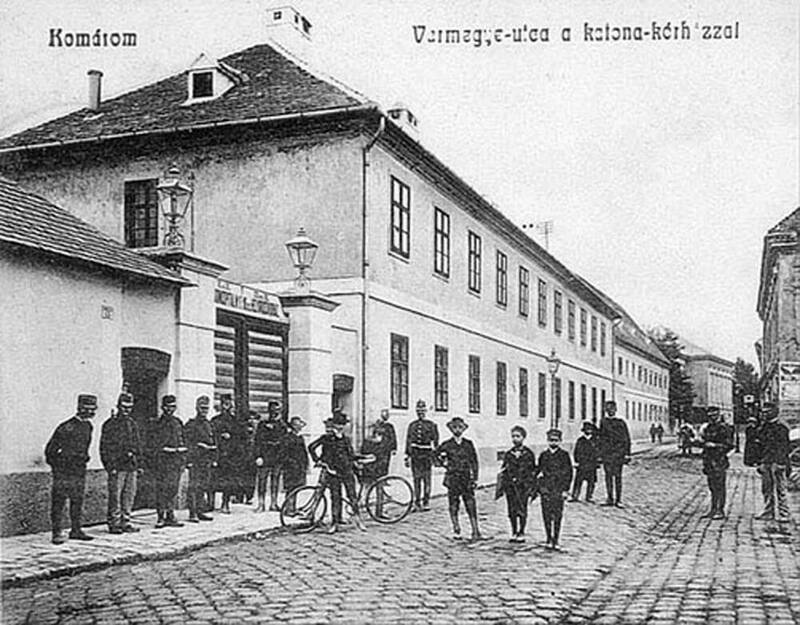 Komárno 1901. Odborové enciklopedie SNTL Praha 1973. Takács Sándor: Hogyan ostromolta a komáromi bírót 2000 török vitéz? Takács Sándor: Igazat mond-e az Öregvár felirata? Takács Sándor: Rajzok a török világból – II. köt.